John’s investment activities and management expertise center upon the intersection of profit-maximizing private capital and the unique requirements and R&D capabilities of the U.S. government. 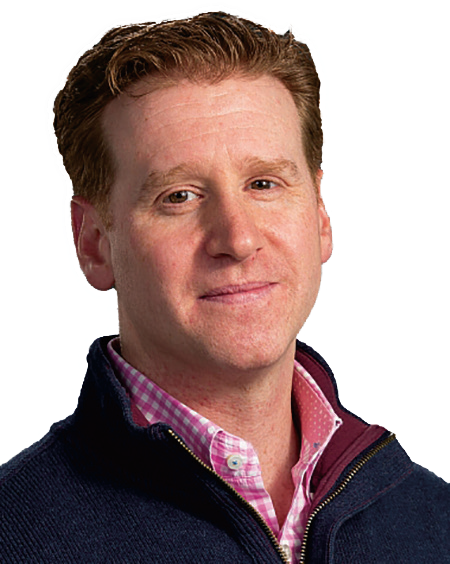 A former Airborne Ranger-qualified U.S. Army infantry officer, John is a graduate of the US Military Academy, Harvard Business School and Harvard Kennedy School of Government. 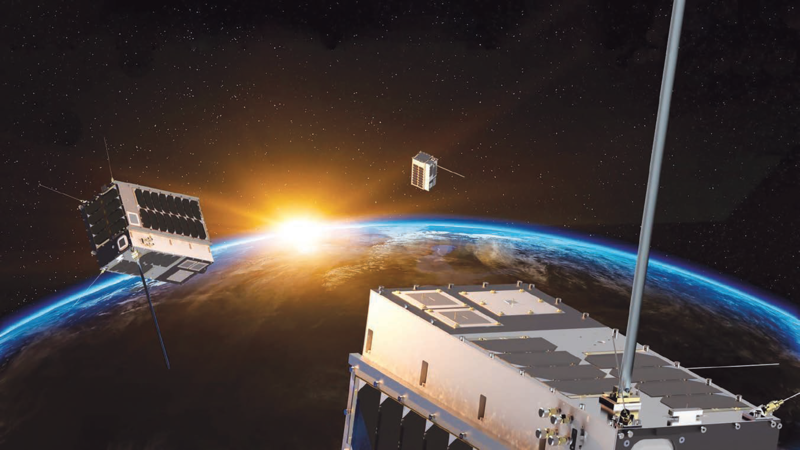 HawkEye 360 launched its first small satellites into space December 2018 to offer customers a new type of radio frequency (RF) remote sensing data. In this interview with CEO John Serafini, the significance of this mission and why space-based RF analytics will bring clarity to previously undetectable activity is discussed, providing new insights for government, maritime, emergency response, and spectrum analysis applications. What does HawkEye 360 do? We are an RF analytics company with a unique constellation of satellites that geolocate RF signals across a broad spectral range. We are the first company to bring this type of capability to market, offering remote sensing of a wide variety of RF signals on a global scale, in all weather, day and night conditions. Using this data, we offer analytical products and services that provide spectrum awareness for many applications. We also fuse our data with other sources, such as electro-optical, synthetic aperture radar imagery, and open source information, to further enhance our products. We recently launched and completed checkout of our first satellites, a cluster of three small satellites that are flying in formation and successfully identifying and geolocating RF signals. Our technology enables independent geolocation, which refers to our ability to triangulate a signal’s position on the earth. This provides us a unique vantage, from which we build foundational products that describe and map signal locations. In addition to our foundational products, we build second-tier analytics and services to deliver behavioral analysis of objects that emit RF. One of our first products will focus on identifying and tracking maritime vessels, but that same concept can be applied to the aerial, border, and battlefield domains. Never before has space-based RF data been commercially available for performing global spectrum awareness. Since spectrum awareness is essential to understanding human activity and our environment, the information we supply will help customers make better decisions. Your satellites recently began gathering data. Why is this such a huge milestone? If you think about the space ecosystem, there are three primary domains of functionality: you can communicate, you can take images, and you can analyze signals. The first two have been commercialized for decades. Companies such as SES, Iridium and Intelsat have successfully commercialized satellite-based communications. Imaging has been handled by companies like DigitalGlobe, and more recently, Planet and BlackSky. However, governments have predominantly led the signals domain, largely due to the technical and cost barriers. It’s a major step forward to have satellites flying in formation that are capable of identifying, processing, and analyzing a wide range of RF signals. We’ve designed and launched a set of satellites tailored for this specific purpose. And we are pleased to have this first-mover advantage and capability to convert this RF data into highly refined and valuable insights for our customers. What products are you excited to bring to market this year? RF signal geolocation is our foundational product. We can identify and track a wide variety of signals between 144 MHz and 15 GHz. We use these signals of interest to create object-based behavioral analytics where we track specific objects like a vessel, a vehicle, or an aircraft. Just being able to bring this foundational RF signal of interest capability to market is major accomplishment. Artistic rendition of the smallsat cluster on-orbit. Image is courtesy of HawkEye 360 and UTIAS SFL. Equally important is our RF survey capability, which analyzes how spectrum is being utilized, provisioned, and deployed at any given frequency, location, and time. Delivering space-based RF surveys on a subscription basis provides our customers timely insights critical to their operations; mitigating the need to deploy survey teams across the globe. These surveys will also offer quick assessment of communications infrastructure after natural disasters, such as hurricanes or earthquakes. What types of customers are you seeking to serve? We’ve built a robust set of customers whose operations will see high-value impacts from using our products. Both within the United States and internationally, we’ve seen how our RF analytics will positively impact a diverse range of organizations, such as defense, intelligence, law enforcement, civil government, maritime, insurance, and telecommunications. In the maritime sector, data gathered by HawkEye 360 can provide visibility for law enforcement into suspicious vessel behavior, giving them better information in their pursuit of illicit activity. We are also using our RF geo-location to help serve search and rescue missions. Instead of having to trust that a GPS beacon is offering an accurate location, we can independently verify the actual location of the signal, which can help speed rescue efforts when time is critical. 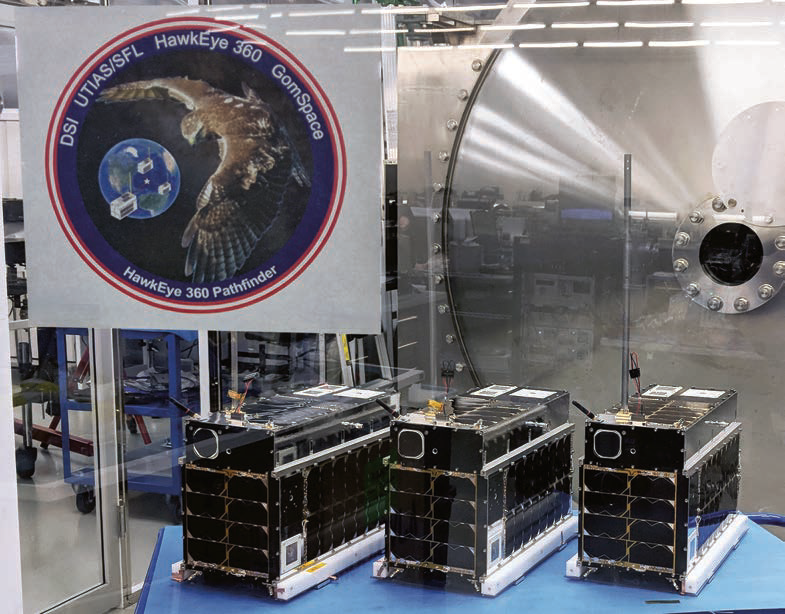 The smallsats before they were launched on December 3, 2018. Photo is courtesy of HawkEye 360. Why is tracking dark vessels in maritime so important? There are trillions of dollars of illicit activity occurring worldwide in the maritime environment. This number reflects the negative impacts generated by illicit activities such as illegal fishing, smuggling of arms, drugs, and people, counterfeiting, oil sanction violations, and piracy. The challenge is that there aren’t great cross-border law enforcement technologies to detect when vessels are attempting to do something illegal. Vessels have a voluntary signal called the Automated Identification System (AIS) that broadcasts their location, but it can easily be turned off, spoofed by the operator, or a third party could spoof it maliciously. If someone is going to do something illegal, they are incentivized to be as quiet about it as possible, which means they are going to turn off any voluntary signals. By doing so, they basically disappear from the radar of law enforcement. Our on-orbit capabilities allow us to identify RF signals of interest emitting from ships and use those signals to create a signature that allows us to track individual ships. We can help determine where they are going and be able to predict their activities and locations. Who are some of the other people currently trying to solve this problem, and what are their challenges? If you are trying to track dark vessels using just AIS, it’s an incomplete technology by virtue of the fact that it can be turned off at any given time. It’s not difficult to pull up a map of AIS traffic and then look at the total anticipated volume of traffic and you can see that there is a significant delta between the two. It is clear that vessels are turning off their voluntary AIS signal, or in some cases, if the vessel is small enough, it’s not required to have AIS. Test of the land reference signals in February of 2018. Image is courtesy of HawkEye 360. Any single approach to detecting and tracking the presence of dark vessels will be limited. For example, sending out aircraft or ships to survey is costly and can only cover so much area. Or trying to accomplish this through satellite imagery alone is like looking through a straw down into the ocean. It’s challenging to detect a dark vessel, and it’s even more difficult to pick up that same vessel on the next pass. We can build an RF profile for a vessel that will help us detect and find that vessel anywhere in the ocean. But more than just using our RF capabilities to detect a vessel, we plan to fuse additional sources of information to create reporting that describes what that vessel is doing. Many different sources can contribute value: coastal radar systems, satellite imaging, synthetic aperture radar, aerial and UAV platforms, vessel databases, and lists of vessels known to be malicious. The challenge is fusing all this data together into a usable format to provide insight about what kind of illegal activities might be involved, at what port the vessel will likely try to disembark its cargo, what kind of trans-shipment opportunities might arise, and potential rendezvous partners the ship has worked with in the past. All this information can be used to support the detection and interdiction of bad actors who are performing illegal activities in the maritime domain. By combining our unique RF analytics with our ability to fuse data sources, HawkEye 360 will be a leader in delivering contextually relevant solutions to our customers. 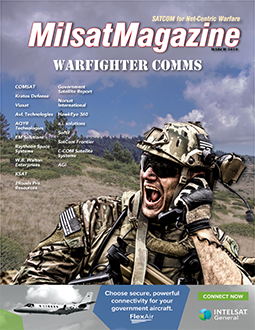 How might the information you produce help satellite communications providers? One challenge that the satellite communications industry deals with is identifying and managing interference. This problem is only going to proliferate as satcom providers grapple with frequency conflicts arising from cellular operators in the emerging 5G space. Once our satellites are conducting routine RF surveys, we will be able to provide continual heat maps identifying interference as it occurs, and in some cases even before it occurs. 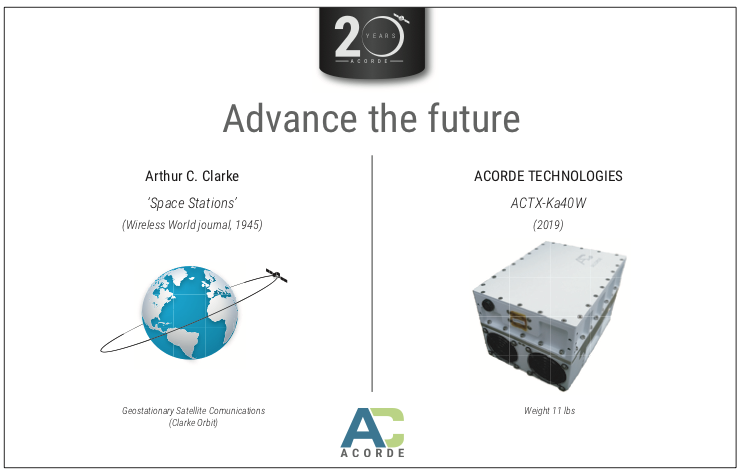 We believe we will be able to help our customers alleviate the time-consuming process of rolling out trucks or aircraft to geo-locate interference terrestrially, and instead be able to efficiently accomplish that from our on-orbit position. What are the next steps for HawkEye 360? Now that our satellites are in orbit and operational, the rest of 2019 is going to be very busy. We’ll be bringing four products to market over the course of the year. We’ll be launching an additional cluster of satellites with increased functionality to further deliver value to our customers. And we’ll be scaling our business to support a diverse ecosystem of customers. Long-term, we plan to continue building the size of the constellation to bring revisit rates under a half-hour.